Well-being has been identified as a key focus at Scots College, so much so that one of the three key College goals established for 2016 is “Promote and support excellent personal well-being and character education for students and staff”. The well-being framework created for Scots, P-E-R-F-O-R-M, is a development tool that has been designed specifically for students and teaching staff of the Scots College community to reflect the unique and special character of this school. PERFORM has a close relationship to the IB curriculum. Each of the PERFORM elements takes account of the relevant IB Learner Profile attributes. Developing a sense of purpose and meaning. Identifying strengths to support goal setting. Improving student engagement and focus. Fostering positivity. Developing social skills. Connecting with others. Building positive relationships. Embracing our special character, heritage and faith based foundations. Exploring the big questions. Considering strategies to help with organisation, study skills and work/life balance. Developing skills and attitudes that underpin resilient behaviour. Coping with challenges. Maintaining mental and physical health through exercise, diet, hygiene and personal health choices. Each element of the PERFORM framework has it’s own pathways for implementation and set of IB Learner Profile traits. The table below summarises these and includes some practice examples of how this is implemented at the College. How is PERFORM brought into a students day to day life at the College? The main driver is the Thursday Tutorial Programme. Students have weekly activities that are specific to their year group and linked to the PERFORM attributes/themes. For example one activity is working on goal setting as part of the focus on the monthly theme of Purpose. Student work in tutorials is completed on their e-portfolios which have been set up and managed by their tutors on Onenote. The e-portfolios also function as a place for students to display examples of work, record their involvement in house activities, service, sport and culture. There is also a monthly award – PERFORMer of the Month, awarded one each to the Middle and Senior Schools. These are decided via staff nominations. Students are nominated for positive behaviour that is linked to the relevant PERFORM theme of that month. 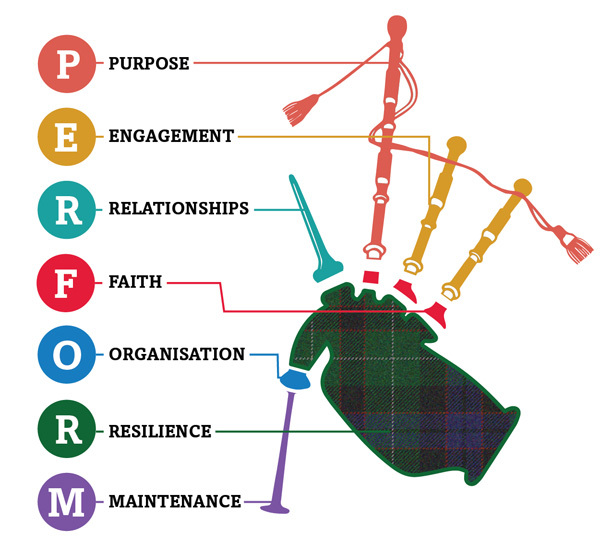 The bagpipes are a metaphor for the PERFORM well-being framework. There are seven main components to a set of bagpipes, each contributing to the overall function of the instrument. Similarly, there are seven components or themes to the PERFORM framework, each contributing to the well-being of an individual. The bagpipes are an iconic symbol of Scots College and play a huge part in the College’s special character. They are a fitting symbol/metaphor for a well-being framework that is unique to Scots College.